Finally, after an entire week with repeated computer overheatings, i finally made what it will be my first creation in BTB for an amateur track designer, where it spans a length of 8.57Km/5.32Mi, holding up to 58 cars. Holding the longest main straight of all fantasy tracks for rFactor out there and such crazy elevation changes giving this a run to enjoy. You may have to apologise for an exaggerated amount of objects out there, but i want to leave with an esthetically pleasing track for eveyone, before it could bore someone. There are currently no setups for Circuit Of Babel. Add a Setup. Its no bad for his first track. most of hills are kinda rough, not smooth. But keep on trying, theres never enough trackmakers. True. 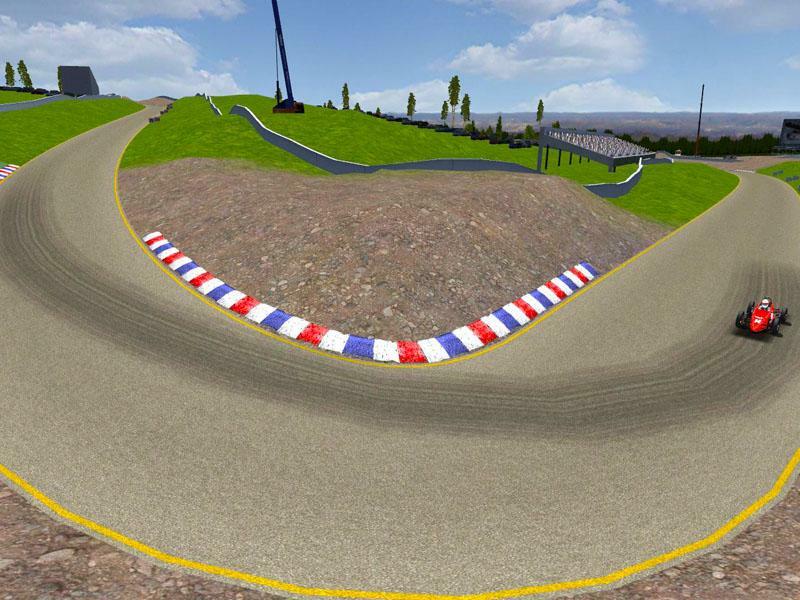 I have already tried the track by now, and I have to say that teher are severe problems. Additionaly to what erwin said, my main problem as a aingle player is the AI behaviour, which is nicely put "odd". They cut corners, resulting in crashes that decrease the number of AIs, depending on the used car mod, to 6-10 cars out of 22 in one (in numbers: 1!) lap. Test the track, you will be "amazed". At Race Department we downloaded his track and gave him some tips to improve his effort. The pit entry and -exit. Build them just as an entry and exit on a freeway. You have to have speed when you enter the track. A track needs gravel traps which are level with the track. It makes the track much more esthetic. Also use armco around the track and place them level with the track. There are trees ON the track. Objects which do not receive lights. He is a beginner, we respect that. But being a beginner releasing your first track after one week, exaggerating some features, he should be carefull with that. Be open for advices and be humble. Unlike the mentioned "longest straight of all fantasy tracks". Well. First of all, the first link is a direct link. Secondly, why shouldn´t he (or she, I have no idea) make a little money with this? Maybe the adfly links should have been marked as such, so only those willing to donate with them, but...it doesn´t cost you as a downloader any money, right? So why bother? By the way: Congratulations for finishing the track, I also tried and failed. I haven´t tested it yet, but it looks nice, though. Considering the fact that the guy who made this was a beginner he did very well. Yes the run off areas shouldn't be as 'bumpy' but like I said, HE'S A BEGINNER. I once tried to make a track. Its was a total failure, I couldn't even finish it. Plus this guy used all his spare time to make this track. So people appreciate it. Before spreading your money making links, you really should read all the critics you got BEFORE you uploaded it here! If you cant remember: Its on Racedepartment BTB forum. It seems you don't even realize how unpopular you're making yourself right now everywhere? Also, dont advert your track with "the longest" etc. if its not right. it was only a matter of time before a-holes started trying to make linkback money for posting their hobby. the human race never ceases to amaze me!